Chart work is the art of laying a safe course, fixing the position and reassuring that position, while steering the ship on that course. It’s an imperative job which every navigating officer should master. It is also one of the top-tier skills which decide the competency of a ship navigator. As there is no margin for errors in chart plotting, deck officers must have the perfect knowledge of doing it the right way . Mentioned below are important points that must be considered while doing chart plotting to avoid errors and do the job more efficiently. The Scale of the chart is the first thing to check before commencing Chart work. The chart scale is given down below the name of the Chart. After taking a note of it, allow yourself to glance through the latitude and longitude graduations along the chart. Once you are familiarised with the scale, the chances to do a wrong plot is largely reduced. The depth scale of the chart should be considered as well. Once you are aware of the scales, read down the notes which is also found below the Chart name. Such notes contain every important information regarding the navigation through that particular area covered by the chart. The information will include any submarine or naval exercise areas, anchoring, fishing areas, traffic separation schemes, any additional information about wrecks, tidal information and also local regulations concerning navigation. A thorough knowledge of Chart symbol is highly insisted. Without understanding the correct symbols and its meaning, the reliability of the chart work will be diminished and the chances of errors will be higher. Any out of ordinary symbols which normally one don’t come across should be noted and checked using Nautical Publication 5011 . While doing Chart plotting, it is a good practise to keep NP 5011 ready for reference. It is the responsibility of the Second officer to keep all the charts corrected up-to date with all permanent and temporary corrections which are received weekly via Notices to Mariners. The permanent corrections are marked on chart using magenta ink and T&P corrections are marked using pencil. It is very important not to miss out these corrections while doing chart plotting. As far as practical, avoid plotting course lines near or above any corrections. T&P corrections are more likely to be missed out as they are marked using pencil and tends to fade out in time. It is also a good practise to check if the corrections are upto date, they are normally mentioned at the bottommost side of the chart. 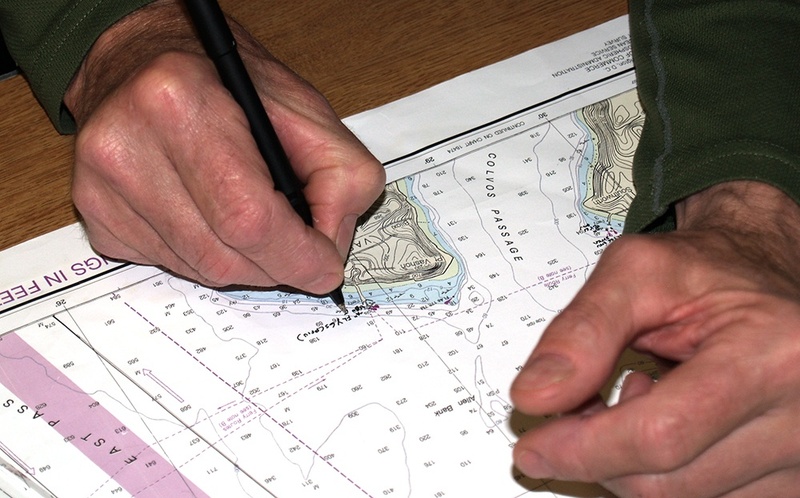 How are nautical charts corrected onboard ships? What are methods to update navigation charts on board ships? GPS positions can be plotted directly on to all new BA Charts as they remain in the WGS-84 Datum. GPS positions have an accuracy of around 50 meters. Avoid plotting GPS positions when navigating in costal and restricted waters as such margins can dangerous. Also while navigating in shallow waters, and when mountains near-by, multi-path errors can take place and hence the accuracy of the position will be further compromised. Radar fix is considered as the most reliable fix while navigating in coastal waters. Radar fixes are best when it is fixed using Radar conspicuous objects such as a Racon or Ramark. Racon and Ramark are indicated on the charts by a magenta circle and are easily identifiable on Radar too. It is recommended to notice them on charts and use for position plotting. While plotting course lines, marking out the Radar conspicuous objects which can be used for fixes will be helpful. Visual fixes will also give reliable positions while navigating near land. They can be taken from lighthouses and other aids to navigation. The bearings from the objects can be obtained using azimuth ring. Such bearings should be quickly and carefully plotted on charts for best fixes. If 3 bearings are used, the position will be inside the resultant ‘cocked-hat’ .The bearings from objects right angles to each other gives the best visual fixes, in practise. Position Circle is a circle drawn from an object (as its centre) and its range from the own-ship as radius. Position Line is a line drawn from the object along its bearing from the ship, the ship’s position is known to be in that line. A fix can be obtained using two parameters. ie, two position lines/ two position circles/ one position line and one position circle. The more parameters the better will be the accuracy of the fix. Since the ranges obtained from Radar are accurate, 3 position circles can give best fixes in practise. When there is only one object available, it is possible to fix the position using the ‘running fix’ technique. While doing chart plotting, the navigator should be familiar with different fixing techniques and use them appropriate to the available resources. Chart work is a skill of accuracy and precision. The safety of navigations depends upon the quality and reliability of chart plotting. Hence the navigators doing chart plotting should do it with utmost care and attention. A wrong course line or position can mislead the vessel and can probably make way to accidents. Over reliance on GPS are commonly seen onboard. GPS positions are best to be used in open seas and the officer of the watch (OOW) must be aware of the accuracy of such positions. Encouraging the use of other fixing techniques we had discussed above, will be promising to enhance the skill of the navigator.